Are you in the running to help out? Mike Lloyd is partially blind but he's got his heart set on running the New York Marathon next year. The Birkdale man is looking for someone, or a number of people, to help him train. Mr Lloyd was born with retinitis pigmentosa, a genetic degenerative disease of the retina. He can see forms and shapes, "but on very bright days or when the lights go out, so does my sight". As a child he had about 10 percent of his vision, could only read books with large print and couldn't see the blackboard in school. His eyesight got progressively worse in his early 20s. "But when I was younger I was able to ride my bike without killing anyone," he jokes. The 36-year-old is a computer tutor at the Foundation for the Blind and teaches computer skills to visually impaired people aged 16 to 90, using enlarged text and speech software. 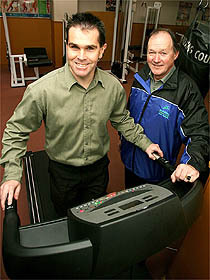 He bought a treadmill last year to improve his fitness and runs about 5km a day. "I needed a challenge, a major goal to shoot for to motivate me to get in the garage and run on the treadmill," he says. Mr Loyd was inspired by a vision-impaired runner who ran the New York Marathon a few years ago. "I did the Round the Bays a few years back and figured that was the end of my athletic career," Mr Lloyd s says. He contacted the Achilles Track Club, which encourages people with disabilities to take part in long-distance running. Formed in 1993, the club has taken 180 people from New Zealand to run in the New York Marathon. Chairman Peter Loft says anyone interested in helping Mr Lloyd train doesn't have to be an elite athlete. “Just someone who runs on a fairly regular basis, runs in some fun runs and is capable of running 10kms or a half marathon," he says. Mr Loft is looking for a number of people to help. "We need a team to work together and get Mike out running on the street two or three times a week". "It takes a very special person because it's a huge commitment and that person has to be the eyes of the runner." About 35,000 runners compete in the 42km New York Marathon. "The course in New York is challenging. You've got concrete streets with potholes and they can be slippery because everyone is dropping water cups that you have to dodge," Mr Loft says. Mr Lloyd is getting married in November and says next year's marathon will be extra special because he'll be celebrating his first wedding anniversary. So does his fiance Barbara help with his training? "She stands by the treadmill and keeps telling me to go faster." If anyone can help, contact Peter Loft, on phone: (09) 524-1534, 021-355-866 or ploft/@schofields.co.nz.